When the baby cheese challenge emerged on Twitter last week it was so unfunny and so awful that most right-thinking human beings expected it to fizzle out in 24 hours. Of course, given Twitter is the platform which often showcases the more questionable aspects of human nature, it didn't. The original video was posted Twitter user @unclehxlmes who later deleted it. He had originally said it was his little brother, but later admitted he took the video from Facebook (it appears to have first been posted by a dad in Michigan) for a joke and did not expect it to go viral or spark a trend. "I have spoken to the child's mother and explained why I have deleted it, it was very invasive for the family and I would like to apologise," he wrote on Twitter. However, the video had already gone viral (it racked up 10.3m views) and sparked a barrage of similar videos. Parents, siblings and other relatives have uploaded videos of themselves throwing squares of flaccid processed singles at the faces of defenceless babies and toddlers (and, in recent days, pets too). The babies are usually trapped in high chairs and don't have the reflexes to avoid it or remove the cheese which, in some cases, covers their eyes, nose, and/or mouth. At best they look confused, at worst they appear to be terrified. Either way it's pretty grim and many people are now calling out those who are posting the videos in the name of humour. While the babies are physically uninjured, some are branding the act 'abusive' and 'distressing' to watch. STOP THROWING CHEESE AT BABIES YOU SICK SICK PEOPLE! 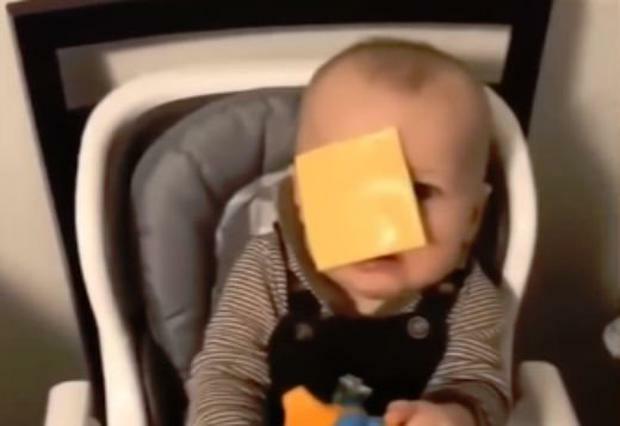 Please stop throwing cheese slices at tender baby and animal faces. Anyone else find this whole throwing cheese in your babies face thing kinda wrong? I can't believe I have to say this but please stop throwing cheese at babies. Who throws anything at a baby's face? WTH is wrong with folks? don’t throw cheese at your baby.